So here’s an interesting mystery. My grandmother was Lillian Solle. She was the daughter of William Solle, born in Springfield, Illinois in 1865, but moved to Madison sometime between 1900 and 1905. His father was an German immigrant from the Kingdom of Hanover (before Germany was a country), also named William Solle. Germany never centralized all the various records from all the principalities and kingdoms after it federated into the German Empire. So there’s not a whole lot of genealogy records online from Germany. If I ever want to dig into the German branches of the family, it’s not going to be easy like it has been with Sweden or Denmark. Consequently, I haven’t pursued much about the Solle family. But now I kinda want to. Solle is not a very common name in the U.S. Searching for “Solle” in Madison newspapers brings up only 732 hits. I haven’t looked through all of them, but I have poked around a lot. 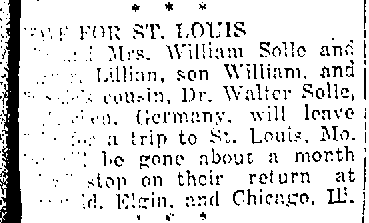 One was an item from the 26 Jun 1924 Capital Times about the Solles (Flora, Lillian, and William Jr.) visiting relatives in St. Louis. Much of the text is faded in the microfilm and unreadable. 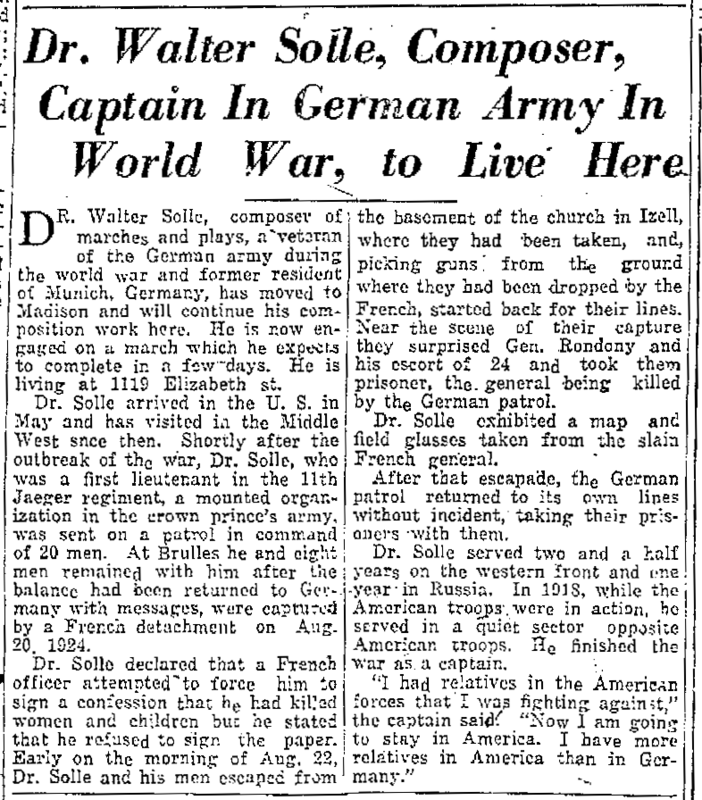 But it mentions a cousin, Dr. Walter Solle. I’d previously noted that and promptly forgot about it. Found my notation yesterday and searched a bit. The first thing I did was search for Walter Solle in the immigration databases on Ancestry.com. Though I can’t read the text of the article, it mentions Germany so I assumed he was visiting from Germany. And there are a lot of passenger manifests post 1900. Bingo. He arrived from Germany in New York on the ship Albert Ballin in May 1924, a month before the trip to St. Louis. And the manifest lists William Solle of Madison as his cousin, so I know this isn’t a different Walter Solle. The interesting thing here is that he lists his occupation as political economist . Which would be cool, because the world of political economy really wasn’t that large in the 1920s. There’s also a second manifest with him on it from 1927, coming from Germany again. This time he’s listed as a merchant, and he’s also a resident alien. I did a narrower search for Walter Solle in the Madison newspapers. If he’s living in Madison now, they were likely to have written about him at some point. Bingo. On 28 July 1924, the Capital Times had an article about him moving to the U.S.
Only instead of being a political economist list he was a couple of months earlier, now his profession is a composer. The article goes into some detail about his exploits in the German Army during World War I. Since the source for those tales was likely Walter Solle himself, I’d tend to take them with a grain of salt. Anyhow, all I know about Walter Solle is contained in those four items. He doesn’t show up in the 1930 Census. No other mentions I could find quickly in the Madison newspapers. Did he return to Germany? Did he die? What was his real profession?